The term diabetes mellitus (DM) describes several diseases of abnormal carbohydrate metabolism that are characterized by hyperglycemia. Globally, the prevalence of diabetes is increasing at an alarming rate. Every few years, the diabetes community reevaluates the current recommendations for the classification, diagnosis, and screening of diabetes, reflecting new information from research and clinical practice. The American Diabetes Association (ADA) issued diagnostic criteria for DM in 1997, with follow-up in 2003 and 2010., The diagnosis is based on one of the four abnormalities: HbA1C, fasting plasma glucose (FPG), random elevated glucose with symptoms, or abnormal oral glucose tolerance test (OGTT)., DM is defined as FPG at or above 126 mg/dL (7.0 mmol/L), HbA1C≥6.5% (48 mmol/mol), a 2-h value in an OGTT (2 h-plasma glucose [2 h-PG]) at or above 200 mg/dL (11.1 mmol/L), or a random (or “casual”) PG concentration ≥200 mg/dL (11.1 mmol/L) in the presence of symptoms. Impaired glucose tolerance (IGT) is defined as 2 h-PG of 140 mg/dL (7.8 mmol/L)–199 mg/dL (11.05 mmol/L) and impaired fasting glucose as FPG of 100–125 mg/dL (5.6–6.9 mmol/L). As the 75 g OGTT is effective for detecting impaired glucose homeostasis, 1 h-PG (1 h- PG during an OGTT) has drawn the attention of the diabetes community as well as 2 h-PG. However, there has been a few researches on 1 h-PG, and furthermore, its normal range has been not enough reported yet. The ADA and WHO recommended only 2 h-PG for OGTT; therefore, most epidemiologists and clinical doctors have been paying less attention to 1 h-PG. However, the 1 h-PG has been well accepted and mainly used for gestational DM (GDM), showing its potential reproducibility and availability in diabetes., Some researchers have focused on 1 h-PG and studied. The determination of the diagnostic cutoff and its diagnostic accuracy, sensitivity, and specificity with 1 h-PG in Korean was needed since there were differences between studies on the diagnostic threshold and moreover the lack of the optimal cutoff for Korean. The advantages and disadvantages of 1 h-PG compared to FPG, 2-h OGTT, and HbA1C in screening and diagnosis of type 2 DM (T2DM) should be studied in large scale. All patients (n = 1433) without known impaired glucose homeostasis (DM and prediabetes) that have been submitted to the Hospital of the Pyongyang Medical College Kim Il Sung University were enrolled in this study. The study was performed according to the rules of the Declaration of Helsinki, and all study patients gave informed written consent. According to ADA diagnostic criteria, 724 subjects were newly diagnosed with T2DM, 115 subjects were newly diagnosed with IGT, and 594 subjects were normal glucose tolerance (NGT) in this study. Their mean age was 61.6 (39–88) years old. The patients with already known DM or prediabetes and the patients using drugs which may affect PG were excluded. The subjects who have trauma, acute infection, severe cardiovascular, liver disease, stroke, and neoplasm and pregnancy were also excluded. All participants were asked to fast at least 8 h before their appointments up to the completion of 75 g OGTT. After the consent was signed, blood was drawn at baseline and subsequently at 0.5 h, 1 h, and 2 h intervals for measuring PG and plasma insulin after ingesting 75 g of dextrose (DextroOGT, Roche Diagnostics, Mannheim, Germany). They were diagnosed as NGT, IGT, or DM by 75 g OGTT. Patients with DM were also diagnosed by 2 h-PG during OGTT, as well as FPG and HbA1C, according to ADA criteria. FPG, 0.5 h-PG, 1h-PG and 2h-PG during OGTT were assessed using Roche-Hitachi autoanalyzer-912. Fasting and 0.5 h-plasma insulin concentrations were determined using Roche Company Kit for calculation of insulinogenic index, HOMA-β, and HOMA-IR. Clinical and demographic data were obtained for each patient. The insulin secretion of pancreas and insulin resistance were analyzed using insulinogenic index, HOMA-β, and HOMA-IR formulas and compared between different 1 h-PG groups using ANOVA test. Insulinogenic index, HOMA-β, and HOMA-IR were calculated by Matthews' method. HOMA-IR = FPG (mg/dL) × fasting IRI (μU/mL)/405. Receiver operating characteristic (ROC) curves were generated to determine the optimal cutoff values and diagnostic accuracy of 1 h-PG (the area under curve [AUC]) for diagnosis of the DM and the IGT using patients diagnosed as DM (by FPG, 2 h-PG during OGTT or HbA1C) and IGT (by 2 h-PG during OGTT) as standard references. 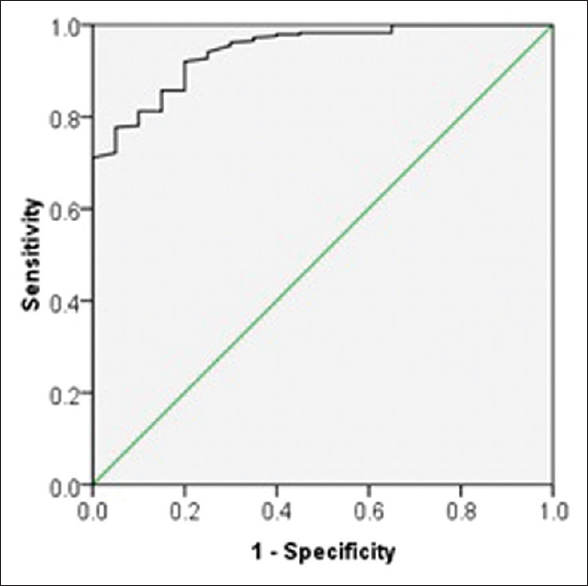 Sensitivity and specificity were determined with the PG value with the highest Youden's index as the critical points. It was evaluated that the diagnostic accuracy was none for AUC <0.5, low for AUC ≤0.6–0.69, moderate for AUC ≤0.7–0.79, good for AUC ≤0.8–0.89, and very good for AUC ≥0.9. For data analysis, SPSS version 22.0 (IBM) was used. We have evaluated ROC of 1 h-PG from the DM and IGT patients diagnosed by the ADA criteria and determined the threshold with the highest Youden's index, sensitivity, and specificity. As shown in [Figure 1] and [Figure 2], the diagnostic characteristic of 1 h-PG for diagnosing DM and IGT was very good. The area under the ROC of 1 h-PG during 75 g OGTT for diagnosis of DM, as described in [Table 1], was 0.944 ± 0.020 (95% confidence interval [CI]: 0.906–0.983) and the diagnostic accuracy of 1 h-PG for DM was very good. The maximum Youden's index was 0.707, and the most optimal cutoff value of 1 h-PG for DM was 231.0 mg/dL in this level of Youden's index. 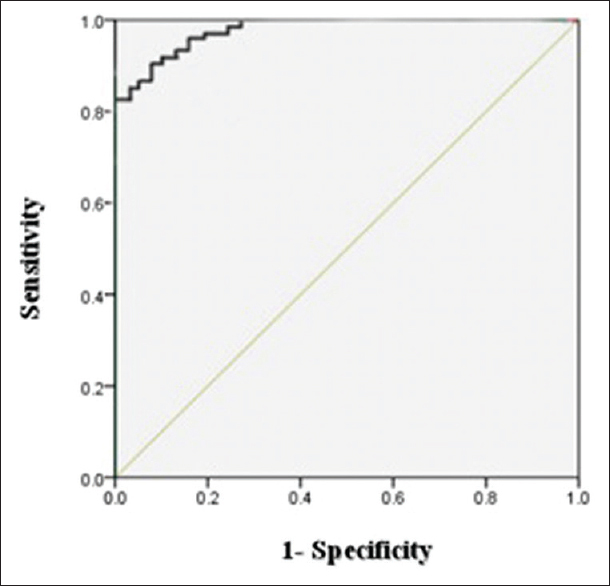 The sensitivity and specificity of 1 h-PG for diagnosing DM were 85.7% and 85.0%, respectively. The area under the ROC of 1 h-PG after 75 g OGTT for diagnosis of IGT was 0.964 ± 0.009 (95% CI: 0.944–0.984), and the diagnostic accuracy of 1 h-PG for IGT was very good. The maximum Youden's index was 0.762, and the most optimal cutoff value of 1 h-PG for IGT was 161.0 mg/dL in this level of Youden's index. The sensitivity and specificity of 1 h-PG for diagnosing IGT were 92.9% and 83.3%, respectively [Table 1]. This shows that the predictive ability of 1 h-PG during OGTT is very good and can be used for diagnosis DM and IGT. We compared the insulin secretion of pancreas and insulin resistance between subjects with different 1 h-PG groups. As our results, 62 (10.4%) subjects among 594 NGT patients had 1 h-PG 161–230 mg/dL. As described in [Table 2], their insulinogenic index and HOMA-β were 0.29 ± 0.024 and 134.2 ± 3.21, respectively, showing nonsignificant differences compared to IGT group with 1 h-PG 161–230 mg/dL, and considerable decreases compared to NGT group with 1 h-PG <161 mg/dL, while HOMA-IR were 2.98. ± 0.124, showing significant increase compared to NGT group and nonsignificant difference compared to IGT group with 1 h-PG<231 mg/dL. Their HbA1C is significantly higher than patients with NGT and similar with IGT group [Table 2]. This shows that 10.4% of patients with NGT was misdiagnosed as “Normal” and they should be diagnosed as IGT because of their low insulin secretion of pancreas and high insulin resistance and HbA1C as much as IGT. Moreover, 34 (29.6%) subjects among 115 IGT patients had 1 h-PG ≥231 mg/dL. Their insulinogenic index and HOMA-β were 0.18 ± 0.025 and 92.0 ± 12.87, respectively, showing nonsignificant difference compared to DM group and considerable decrease compared to IGT group with 1 h-PG <231 mg/dL and NGT group, while their insulin resistance were 3.10 ± 0.456, showing significant decrease compared to DM group and nonsignificant difference compared to IGT group with 1 h-PG <231 mg/dL and NGT group. Their HbA1C is significantly higher than patients with IGT and lower than DM group [Table 2]. This shows that 29.6% of patients among IGT were misdiagnosed as “IGT” and they should be diagnosed as DM because of their low insulin secretion of pancreas as much as DM. This study suggests that 1 h-PG during OGTT can be used in identifying those with the abnormal glucose homeostasis. Indeed, abnormalities in 1 h-PG may represent a more severe metabolic perturbation, characterized by higher glycemia, lower insulin sensitivity, and markedly reduced beta-cell function. Recently, it has been proposed that the 1 h-PG during OGTT (≥155 mg/dl) has better predictive power to disclose future diabetics than either FPG or 2 hPG., Two longitudinal studies among adults have shown that 1 h-PG during OGTT performs equally or better than 2-h PG concentration in predicting of the risk of type 2 diabetes in Mexican Americans and Caucasians. In our study, the cutoff value of 1 h-PG for diagnosis of DM and IGT were 231 mg/dL and 161 mg/dL respectively. Moreover, the area of ROC were 0.944 ± 0.020 (95% CI: 0.906–0.983), 0.964 ± 0.009 (95% CI: 0.944–0.984), respectively. This shows that 1 h-PG can provide very high diagnostic accuracy, and is available in the diagnosis of DM and IGT. Moreover, its sensitivity and specificity are also as high as currently used diagnostic indices. The 1 h-PG can overcome the several drawbacks such as failure in diagnosing with FPG, time-wasting with 2 h-OGTT and non-cost-effectiveness with HbA1C. Furthermore, the 1 h-OGTT is well accepted and mainly used in diagnosis of GDM. Women with a single abnormal glucose value of 1-h OGTT in the late second trimester (1-h Gestational Impaired Glucose Tolerance [IGT]) had outcomes similar to those with true gestational diabetes, including increased infant birth weight and postpartum insulin resistance. Similarly, Jovanovic have found that 1 h-PG during pregnancy was the best predictor of HbA1C in patients with well-controlled T2DM. Logistically, 1 h-PG is less resource intensive than the 2 h-PG, both from a provider and patient perspective. If its value is equivalent to the 2-h in identifying risk, then the 1-h would be a more cost-effective assessment tool. These are theoretical and practical basis for adoption of the 1 h-OGTT in DM and IGT. In clinical practice, we can occasionally meet patients with considerably elevated 1 h-PG, but not FPG, 2 h-PG, and HbA1C. These patients are usually assessed as NGT or IGT and on the other hand, the doctors have been having difficulties with obvious diagnosis since their 1 h-PG were too far high and there was no clear criteria on 1 h-PG for diagnosis of DM and IGT yet. Impairment of insulin secretion of pancreas and increase of insulin resistance is the most important in pathophysiology of DM. Several studies suggested that 1 h-PG is closely associated with insulin secretion of pancreas and increase of insulin resistance and has good predictive ability for long-term outcome. Joshipura et al. suggested that 1 h-PG showed similar partial correlations with fasting glucose and 2-h OGTT (r = 0.60 and 0.64 respectively). In addition, fasting glucose, fasting insulin, and HOMA correlated better with 1 h-PG (r = 0.60, 0.47 and 0.52) than with 2 h-PG (r = 0.50, 0.41, and 0.45). The aim of our study was to establish how to evaluate the patients with elevated 1 h-PG. As our results, 10.4% of NGT subjects diagnosed by the present ADA criteria had 1 h-PG equal to 161 mg/dL or above, their insulin secretion level of pancreas was as low as IGT patient, insulin resistance was higher than NGT subjects with 1 h-PG <161 mg/dL. This shows that 10.4% of patients with NGT was misdiagnosed as “Normal” and they should be diagnosed as IGT because of their low insulin secretion of pancreas and high insulin resistance and HbA1C as much as IGT. Moreover, 29.6% of “IGT” patients diagnosed by the present ADA criteria had 1 h-PG equal to 231 mg/dL or above, their insulin secretion level of pancreas was as low as DM patient, insulin resistance was lower than DM. This shows that 29.6% of patients among IGT was misdiagnosed as “IGT” and they should be diagnosed as DM because of their low insulin secretion of the pancreas as much as DM. This result showed that these patients could be missed to diagnose as IGT or DM by present diagnostic criteria without using 1 h-PG and the increase in 1 h-PG is mainly caused by decreased insulin secretion level and is also associated with insulin resistance in some degree. Therefore, we suggest that 1 h-PG should be actively used in screening and diagnosis abnormal glucose homeostasis. The patients with elevated 1 h-PG should be considered as impaired glucose homeostasis (i.e. IGT or DM), and therefore treated in time. American Diabetes Association. Diagnosis and classification of diabetes mellitus. Diabetes Care 2017;40 Suppl 1:S11-4. Tward C, Barrett J, Berger H, Kibel M, Pittini A, Halperin I, et al. Does gestational diabetes affect fetal growth and pregnancy outcome in twin pregnancies? Am J Obstet Gynecol 2016;214:653.e1-8. Bühling KJ, Winkel T, Wolf C, Kurzidim B, Mahmoudi M, Wohlfarth K, et al. Optimal timing for postprandial glucose measurement in pregnant women with diabetes and a non-diabetic pregnant population evaluated by the Continuous Glucose Monitoring System (CGMS). J Perinat Med 2005;33:125-31. Manco M, Panunzi S, Macfarlane DP, Golay A, Melander O, Konrad T, et al. One-hour plasma glucose identifies insulin resistance and beta-cell dysfunction in individuals with normal glucose tolerance: Cross-sectional data from the relationship between Insulin Sensitivity and Cardiovascular Risk (RISC) study. Diabetes Care 2010;33:2090-7. Abdul-Ghani MA, DeFronzo RA. Plasma glucose concentration and prediction of future risk of type 2 diabetes. Diabetes Care 2009;32 Suppl 2:S194-8. Abdul-Ghani MA, Stern MP, Lyssenko V, Tuomi T, Groop L, Defronzo RA, et al. Minimal contribution of fasting hyperglycemia to the incidence of type 2 diabetes in subjects with normal 2-h plasma glucose. Diabetes Care 2010;33:557-61. Abdul-Ghani MA, Abdul-Ghani T, Ali N, Defronzo RA. One-hour plasma glucose concentration and the metabolic syndrome identify subjects at high risk for future type 2 diabetes. Diabetes Care 2008;31:1650-5. Abdul-Ghani MA, Lyssenko V, Tuomi T, DeFronzo RA, Groop L. Fasting versus postload plasma glucose concentration and the risk for future type 2 diabetes: Results from the Botnia study. Diabetes Care 2009;32:281-6. Mayo K, Melamed N, Vandenberghe H, Berger H. The impact of adoption of the international association of diabetes in pregnancy study group criteria for the screening and diagnosis of gestational diabetes. Am J Obstet Gynecol 2015;212:224.e1-9. Retnakaran R, Qi Y, Sermer M, Connelly PW, Zinman B, Hanley AJ, et al. Isolated hyperglycemia at 1 hour on oral glucose tolerance test in pregnancy resembles gestational diabetes mellitus in predicting postpartum metabolic dysfunction. Diabetes Care 2008;31:1275-81. Jovanovic L. Rationale of prevention and treatment of postprandial glucose-mediated toxicity. Endocrinologist 1999;9:87-92. Uma R. Maternal metabolic syndrome 5-10 years after delivery in women with abnormal 1 hour glucose screening. Am J Obstet Gynecol 2015;212:S1-2. Joshipura KJ, Andriankaja MO, Hu FB, Ritchie CS. Relative utility of 1-h oral glucose tolerance test as a measure of abnormal glucose homeostasis. Diabetes Res Clin Pract 2011;93:268-75.